If Apple’s aim of making the iPad as essential to education as pencils and paper comes to pass, it will be apps like Inside the World of Dinosaurs that help make it happen. The education offering from M5859 Studios packs in a wealth of audio, visual, and written information into an engaging iPad app. Inside the World of Dinosaurs takes its monstrous reptiles seriously. Launch the app, and you’re treated to extensive overviews of the Triassic, Jurassic, and Cretaceous eras. Articles cover everything from what the dinosaurs ate to how fossils are formed. A visual timeline shows what dinosaurs walked the earth during what period. And, should you not want to handle all this reading by yourself, just a tap of a button summons actor Stephen Fry, who supplies the narration. Then there are the dinosaurs themselves—Inside the World of Dinosaurs features a lengthy list of dinosaurs, each with their own entry. Tap on one for a description, including data on their habitat, size, predators, and more. The app will even mimic the dinosaur’s sound and, if you tap on its name, Stephen Fry will pronounce things for you. 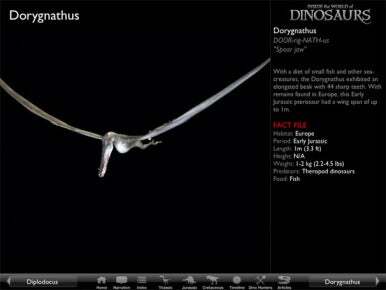 Most impressive, however, are the 3D models depicting how each particular dinosaur moved. You can pinch to zoom on those, while other models are rotatable for a complete look at every angle of the dinosaur. All told, Inside the World of Dinosaurs claims to offer 310 fully interactive 3D models, including 60 photo-realistic models of dinosaurs and 40 more 3D recreations of dinosaurs in mid-flight. I didn’t sit down and count every model in the app, but it felt pretty thorough to me. The price for all this data—besides the app’s asking price—is space. Inside the World of Dinosaurs takes up a hefty 891MB of your iPad’s capacity. When I first downloaded the app, I had to clear out some space on my 16GB tablet; granted, I have a lot of apps on there for testing purposes, but I think many users will find themselves needing to make room for this brontosaurus-sized app. Kids can get hooked on dinosaurs at a pretty early age, but I’m not sure that the depth of Inside the World of Dinosaurs is a great fit for especially young kids. While the app’s description contends that it will “enthrall everyone of all ages,” the tone of the material seems most appropriate for students in the upper reaches of elementary school or even middle school. That said, younger kids will love the 3D models and the dinosaur sounds, and the included narration can handle the heavy lifting for budding readers. Navigating your way through Inside the World of Dinosaurs is easy enough—the app features tabs at the bottom to jump to different sections, and an Index tab in particular features an A-to-Z listing of every dinosaur included in the app. However, there are still some navigational missteps. Articles include tappable words, which allow you to jump to related materials elsewhere in the app. That’s great, but once you jump, there’s no easy way to get back to where you started. Should you tap the Triassic link in the write-up for the herrerasaurus, you’re on own for finding your way back to that dinosaur entry. 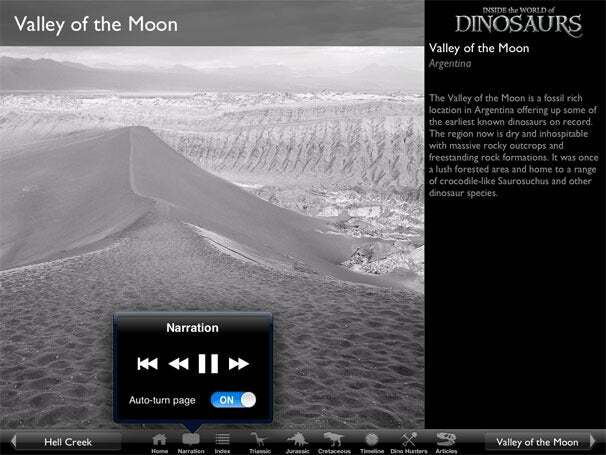 Read It to Me: A button in Inside the World of Dinosaurs allows you to control the narration provided by Stephen Fry. I did most of my testing for Inside the World of Dinosaurs on an original iPad. That can be fraught with peril—a growing number of apps don’t run very well on this two-year-old tablet, and even Apple plans to drop support for the original iPad with this fall’s iOS 6 release. Yet, Inside the World of Dinosaurs ran flawlessly on my older iPad: The graphics still looked great and the 3D models moved without a glitch. There are some remarkable things happening with educational materials designed for the iPad. Inside the World of Dinosaurs showcases the great ways multimedia can open up new ways of learning. If you find the subject the least bit appealing, the app is certainly worth a download.